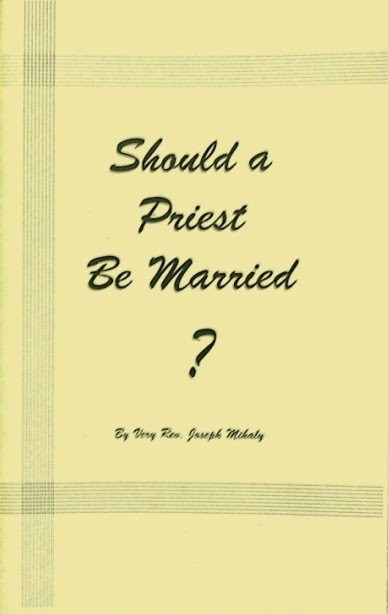 Recently republished is a book on the married priesthood (see below). After reading this recent article in the National Catholic Register, I though it worth giving a shout out to this important historic and doctrinal work. While some of the prefatory comments have a decidedly particular audience (Rome and Rusyns), the arguments themselves have a universal application. (NCRegister) - ST. LOUIS — Surrounded by his wife, daughter and the bishops of his Church, Father Wissam Akiki made history in February as the first married man in 90 years to enter the priesthood for the Maronite Catholic Church in the U.S. But for Catholics of most Eastern-rite Churches in the U.S., including the Maronites, the fact the priest is a married man isn’t that extraordinary: What’s extraordinary is that they have to ask the Vatican for permission to ordain married men in the first place. Eastern Catholic bishops of the Ukrainian, Ruthenian and Melkite traditions have been cautiously ordaining married men to the priesthood in the United States since Blessed John Paul II relaxed decades-old rules and opened the door to them on a case-by-case basis approved by the Vatican. Now, the Maronites are following suit. On Feb. 27, Bishop Elias Zaidan of the Maronite Eparchy of Our Lady of Lebanon ordained Father Akiki. But the Holy Father’s approval of Father Akiki’s ordination marks “no change at all” to the Latin Church’s ancient tradition of a celibate-only priesthood, explained Paulist Father Ronald Roberson, an authority on Eastern Churches with the U.S. Conference of Catholic Bishops. “The tradition of a wholly celibate diocesan clergy is really something that is a characteristic of the Latin Church, but not the [entire] Catholic Church,” he said. (Orthodox Goods) - A verbatim reprint of the 1942 original. It is a staunch defense of the married priesthood of the Eastern Orthodox and Eastern Rite Catholic Churches. It was written by the Very Reverend Protopresbyter Joseph Mihaly in answer to the forced celibacy of the Roman Catholic Church on the American immigrants from Eastern Europe and is a primary source on the history of the American Carpatho-Russian Orthodox Diocese.